Social media has a ton of power. For search engine ranking as well. Unfortunately, though, a lot of marketers are ignoring social media in the belief that it doesn’t help SEO and their website rank on search engines but ignoring social media in your SEO can be a deadly mistake. If you’re reading this, you’re already ahead of your competitors. In this article, we’ll be going through How To Improve SEO With Social Media. Social media is terrific when it comes to SEO, because it is a unique way of building authority websites. Too many people are looking for quick fixes for ranking their website such as trying to get as many backlinks to their website as possible, with black hat strategies, but social media take a different approach to SEO. A very relevant quote when discussing this subject is the following: “It’s not the actual social activity that matters, but what happens as a result of that activity. Optimizing and maximizing creator impressions increases the chance of obtaining links from the group of people who power the link graph.” – AJ Kohn”. This is exactly what social media does. It will most often don’t provide you with quick-fixes on ranking your website but it will definitely speed up the process and increase brand recognition on the way. Let’s assume that you are sharing an article on your social media page which has a good following base. This increases the visibility of your page and the article which may cause a potential influencer to take notice. Then they share it. Now your content is amplified. There are so many possible scenarios when it comes to sharing your blog content on social media so it’s difficult to mention them all but brand recognition is still one of the key points here. When you develop a brand awareness over time, you also develop a trust between you and the visitors. Getting people aware of your website can be the deciding factor on which search result they decide to click on when searching in Google. If they have three search results – two of the websites they’ve never heard of and the third website is yours – that they have seen on social media, the chances of them choosing your website over the others is greater. Here comes the beautiful thing. If your website ranked lower than the other suggested search result but the person still chose your website, it will eventually send signals to Google that the second search engine result is more popular than the first as it is getting more clicks. Google will then assume that the second result (or whichever place you’re ranking on) is more relevant to the Google user and will, therefore, change the position of your website higher up to better please their users’ needs. It may be hard to imagine this when posting content on social media but examples like these are the most common ways social media can help with SEO. Although social media doesn’t generate any direct link juice, the indirect link juice it can give your website can be even more powerful. 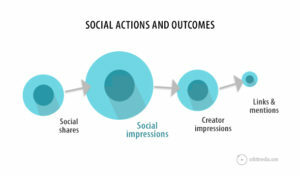 The indirect result is that social media helps drive traffic. More traffic to your website results in an increased authority of your site which will ultimately help you rank better on search engines. Now, this one is a bit tricky and very discussed. Back in 2010, Google didn’t use Facebook and Twitter as ranking signals but in a YouTube video made by Matt Cutts (from Google) in 2010, he explained that now, Google uses Facebook and Twitter as signals on how discussed a website is on those platforms. And it makes sense. If a website is talked about a lot on those social media platforms, it sounds reasonable to take that into consideration when deciding how to rank a page on Google. And that is exactly what Google does. Although Google has said that they’re not looking at links to a website and considering them as backlinks, instead, they use Facebook and Twitter to see more real-time happenings and events and if a website is talked about a lot during a certain time period etc. which ultimately can help that website rank higher. Matt Cutts added that these types of indications are used relatively lightly for now but continued to say that they will see how much they will be using social media as a ranking factor in the future depending on how useful it is and how robust it ends up being. He especially added that you shouldn’t go out trying to obtain a huge following just because you believe that it will help your website rank higher. Instead, you have to think about the quality of those follows and the quality of the mentions you are receiving on social media. These are the real things that play an important part in how Google use social media as a ranking factor. To summarize it: It is the social signals that have the most power when it comes to increasing your SEO with social media. That basically means that if Google sees a trend of mentions around your website, it might be a good idea to rank your website higher. I know that some people won’t agree with me here but it’s true! If you have checked your webmaster tools lately, you will notice that comment links on Facebook posts now show up in your backlinks profile. This means that Facebook is able to generate backlinks to your website. However this may not be the best quality links, they are similar to forum comments for example – which is low-quality and links that are very weak for ranking. If the links show up in your webmaster tools then they are “do follow” links and are considered backlinks so why not use them every now and then, even if they are weak. 5. 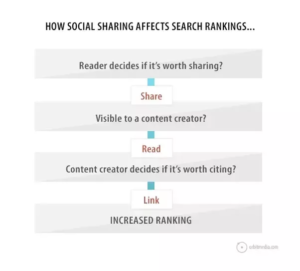 Social Media Shares Are the new backlinks? As we discussed earlier, Google has now started using Facebook and Twitter as ranking factors, even if very lightly at the moment. As Google has a problem with black-hat SEO and link-buying when it comes to backlinks for websites, Google is slowly looking at new ways to decide a website’s rank on and it looks like social media is becoming more and more important for a website’s rank and will probably also be even more so in the future. Instead of backlinks, however, when it comes to social media, Google mostly looks at mentions, Tweets, Facebook posts and overall discussions regarding your website. If you still believe that social media won’t have any power when it comes to SEO, you might be in danger because sooner than we may think, Google might decide to put more weight into social media mentions and signals.